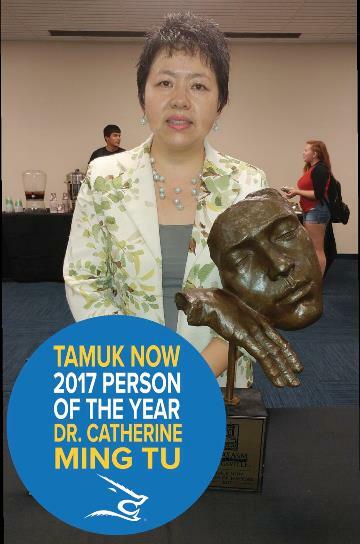 Dr. Catherine Ming Tu, assistant professor of music education, was selected by the campus NOW organization as Person of the Year for 2017. Tu teaches music education methods classes that are designed to train music teachers and to promote and improve music education in children from early childhood to middle school. Her research centers on infant and toddler music behaviors and their interactivity with the iPad; music and autism; and the early impact of music on general intelligence and linguistic skills. Undergraduate Research Award, Spring Research Award and the College of Arts and Sciences Arts and Humanities Research Award. In 2008, she received the prestigious Presser Music Award for her creation of a children’s music curriculum, Authentic Chinese Children’s Songs and Music. South Carolina where she received another bachelor’s degree in music and a master’s degree in music education. She taught elementary music in Cleveland before accepting a full scholarship and assistantship at the University of Miami Frost School of Music where she received her doctorate. She is certified by Musikgarten Family Music, Cycle of Seasons, Orff-Schulwerk and GIML Early Childhood, elementary and instrumental music. Tu has made presentations at professional conferences in Mexico, China and the United States. Her research has been published in Research Perspectives in Music Education, the Bulletin of the Council for Research in Music Education and Perspectives: Journal of the Early Childhood Music and Movement Association.